The color options are almost limitless for the railings and spindles because you are using a solid deck stain or paint. These can be tinted to almost any color imaginable while most transparent stains are normally limited to tones of naturals, browns, and reds. When deck paint or solid stains are applied properly on vertical surfaces they are extremely durable and can last a long time. On a vertical surface film forming, solid stains can last up to 10 years and may only need to be cleaned occasionally. 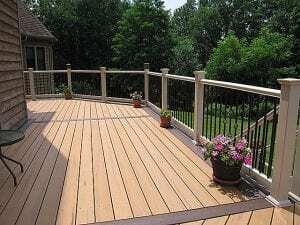 However, solid stains and paints do not perform well on horizontal surfaces such as decking and are prone to cracking and peeling so only use them on the vertical surfaces. 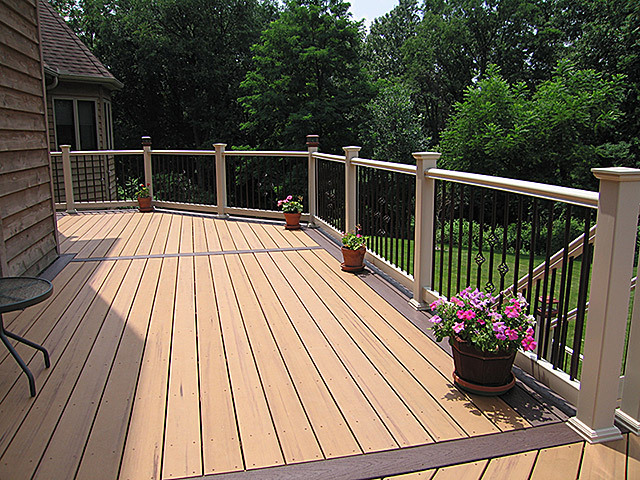 A properly done two-tone deck can really add appeal and value to your property. It may take a little more time and labor initially but as some deck owners know, the end result can be amazing. 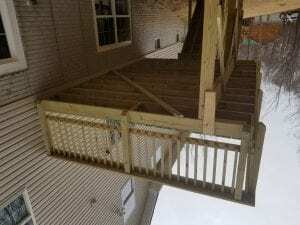 We didn’t do the right research when we built our upper deck. It started out as a maintence project and turned into a complete tear down and rebuild. We used regular pine, sanded & stained as it was being built with all in one Behr. Less than 2 years later, with mildew, and peeling, we are re-doing. We were advised to use the stripper that matched the stain we used, so used the Behr stipper. Not very helpful & very messy. Doing the research now, I realize I should not have used regular pine, or sanded or stained when being built. We have been sanding this 12×14 deck for hours & hours (with helpers). The spindles are tedious & it is challenging to get to all the nooks and crannys. I am trying to preserve the underneath by not having to sand and restain. I am hoping I will be able to scrub off the stipper than left white from between the floorboards on the underside. The deck gets all afternoon sun. We also added rafters/pergola above which gets the worst UV exposure. 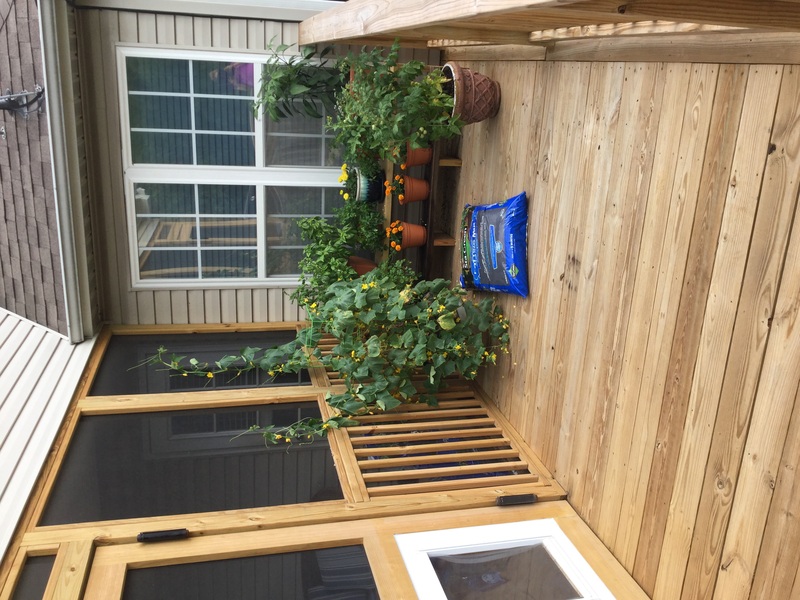 I am considering replacing the pergola with cedar or pressure treated wood. If I do, is there any product I can use on it now or do I need to wait until next year to take them all down again and add perhaps a clear marine varnish or a stain? I want to clarify that the semi transparent stain is better on the floors/top rails vs. semi solid. Is an elastomeric coating an option I should pursue? I was all set to go with AC semi trans & they have been so helpful to answer questions on the phone & mailed me samples. However, I came across a website that tested many stains over 14 months, & the AC stain was graying considerably. Now I am looking at TWP or Cabot. 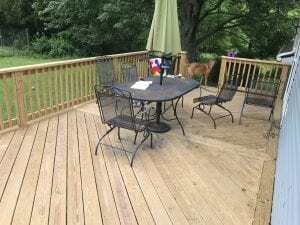 However, I like the fact I reach an owner when I call, I have actual samples to test the color and the reapplication doesn’t require special products to clean the deck. I was also set to use an oil stain this time and then I read that the water based stains last longer. The more I research, the more confused I become. My goal is to make the best of what I have with the longest lived product available. -No, you cannot top coat with a marine varnish on a deck. -Use a semi-transparent penetrating stain. Not a elastomeric stain. New deck installed last fall, allowed to cure through winter and spring, now time to stain. Trying to decide all one semi-transparent vs. a two-tone since the design of the deck would look nice that way. Considering a darker stain on the “frame” and verticals and a lighter stain on the 45 degree pieces. I don’t want to use any solid since both colors will be on the horizontals. Thoughts? Recommendation on brand and color? I plan on cleaning and brightening either way. If you do not want a solid on the verticals, then do it all one color. Try TWP stains or Armstrong Clark Wood Stains. I was leaning that way. I think it would look cool (see picture), but I don’t know that it would be worth the trouble or if the different stains would age differently causing touch ups to be done at different times on the different colors. That’s a composite deck. It would be very hard to maintain a stainged deck like that. 1. We would do the railings and spindles in white but I’m not sure what else. The railing are mounted to the sides, not the top. Our thoughts for the horizontal deck was a darker shade of brown in either semi-solid or semi-transparent. 2. Semi-transparent vs. Semi-solid. Thoughts? Do they hold up equally well? 3. The stairs and supports. I assumed they would be in the darker color but unsure. Basically I’m unsure how to make this look good in two-tone. Do all verticals in the solid color. 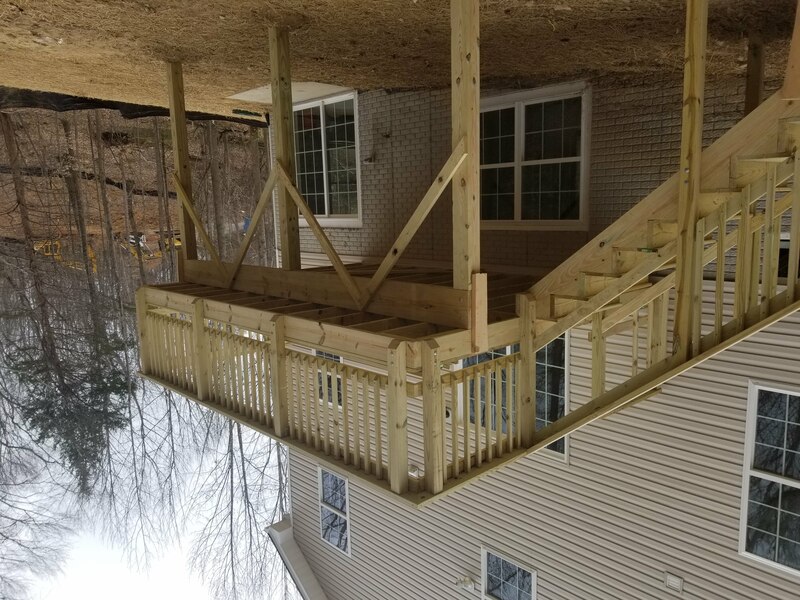 This includes railings, outside edges of the deck, risers of steps, framing underneath, etc. Basically, if you are in the yard looking at the deck, you would see the solid color. Use Flood Solid Stains. For the Horizontals, do all flooring, top of steps, and tops of rails. Use a semi-transparent. Dark Oak by TWP or Rustic Brown by Armstrong Clark. Posts some pictures when done! I have stained my deck with Olympic Stain 3 times over the last 20 yrs and loved it. However the last time (last summer) it started to peel off in spots. What can i do to correct this problem before I restain it this year? Strip or sand it down to the bare wood and start over. FYI, the Olympic has gone through numerous formula changes and is not as good as it used to be. I installed new deck wood in June this year, it is not Oct 3. Should I wait until next spring to stain or has it been enough time to stain before winter? You can do it now. Prep first. Deck cleaner and then a wood brightener. I have a stain that I need stripped off. I did a small section to test it. The salesman said to do 10 ft sections at a time. The question is, do I put the revive on it RIGHT after I am done with each section or do I wait till I get the whole deck done? what is the time frame between stripper and revive.? Do you mean Brightener? You can neutralize with the brighener after you strip all of the wood. 1)Do I need to do any SPECIAL PREP AFTER SANDING BARE or can I simply apply the finish right away? 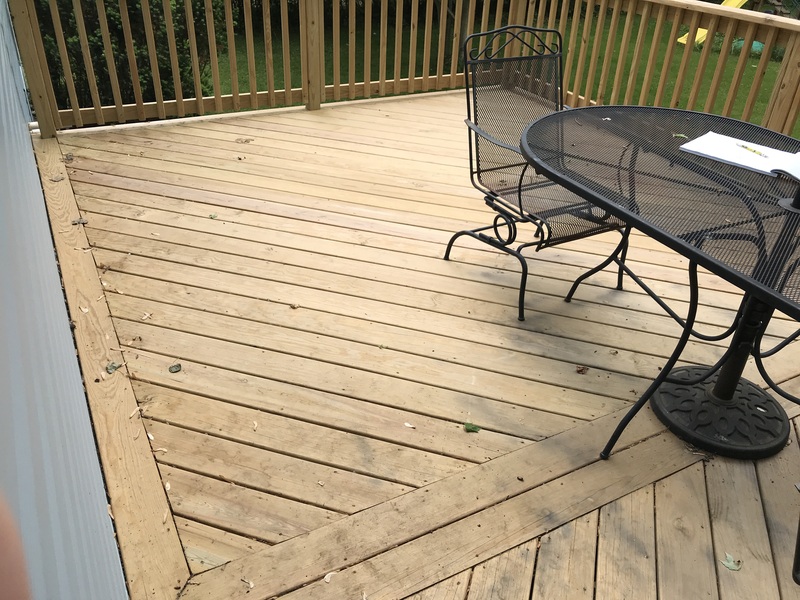 I want to refinish with a semi solid or semi trans on the deck surface but would love to cover up defects with a more opaque finish, PREFERABLY ONE THAT CAN BE TINTED. The wood is pressure treated pine and is about 20 years old. I can’t seem to find any tintable stains outside of Sherwin-Williams which I do not want to use. 2)Can you RECOMMEND A HIGH QUALITY STAIN WHICH CAN BE TINTED? I cannot use a high VOC product in Massachusetts. 3)IS IT REALLY MISSION CRITICAL TO RESAND AFTER RAIN?Also I have read that if the wood gets wet after sanding that the grain would raise and would have to re-sand. I am using a Metabo paint remover tool followed by a 36-40 grit sandpaper. 1. Tintable semi-trans or semi-solid stains mean they will not be penetrating stains and will dry on top of the wood like a paint, resulting in the potential of peeling. For a true penetrating stain for the floor, it will need to be pre-tinted. We would suggest the Armstrong Clark in a semi-trans or semi-solid for the floors. After the sanding, pressure cleaning and brighten the wood for final prep. 3. Resand after rain? No, you do not have to do that. Rain would actually help to open the grain by “swelling” the wood pores. Raising the grain is a positive, not a negative. it allows the stain to soak in better. 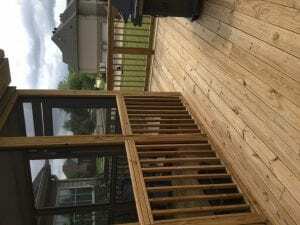 I stained my deck shortly after it was built last summer, with a semi-transparent stain by Sherwin Williams. The stain is peeling & is worn off. I now realize I should have waited for a year before staining it. I plan to strip it & clean it with Restore a Deck product & will be using Armstrong Clark semi-transparent stain. Will it be ok to stain it now, or should I wait another year. Once prepped, you can stain now. Best stain for a new deck(8 months old)? Full sun, southern exposure with a screened in area. 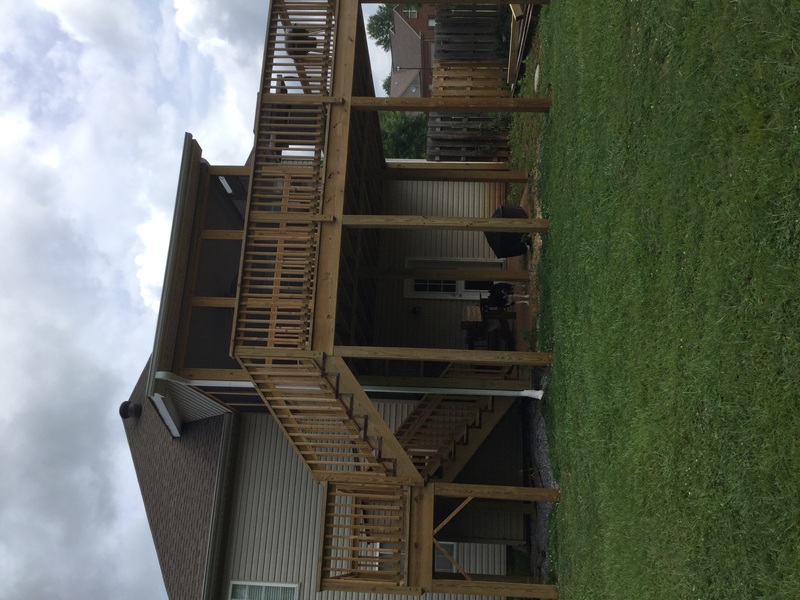 Originally I was thinking of going with white railings and grey deck floor, but may be leaning towards a more “traditional” deck floor color since semi-transparent is the way to go rather than a solid on floor. You could do a penetrating semi-trans for the floor that is gray? Armstrong Clark Driftwood gray. What is the easiest method to paint/stain around the bottom of the balusters (where white meets brown)? Use blue tape on that area? Or use an edger? My cleaner dried before I put the brightener on it. Can I still put the brightener on it? Yes but wet the deck down first. In the picture above the railings and the horizontal wood on top of the railings are all white, but I read your comments about the horizontal surfaces peeling with the solid stain. 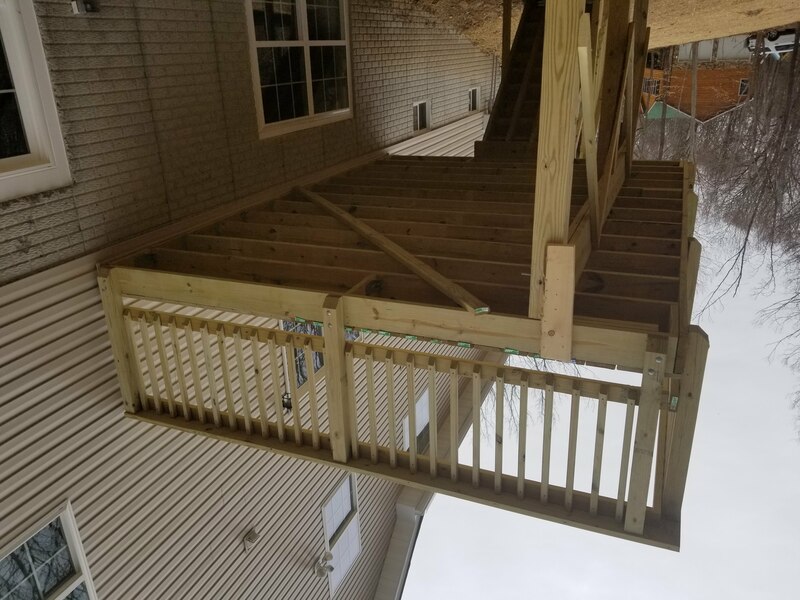 I prefer the horizontal top of the railings to be the same color as the vertical posts, as in the picture, with the floor of the deck a different semi-transparent color. 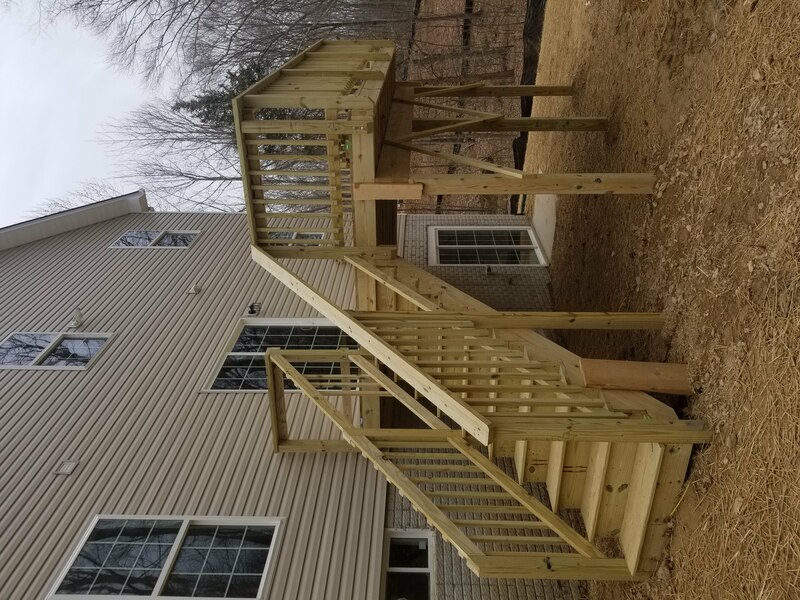 Is there any way to achieve this look or am I stuck staining the top of the railings and the deck floor the same color, with just the posts and railings white? You can stain the tops of the railings the same color as the rest of the railings. The only downside is that the tops of the railings will need a touch every 2-3 years like the semi-transparent floorboards. The vertical parts of the railings will last much longer before touchup is needed. We are doing a two tone deck. It used to have a solid stain so we have done the stain stripper, sanded, and are getting ready to do our brightener on the deck itself. we will be doing an oil based more transparent stain on deck. For railing we want to do a solid stain or paint (different color). It is still in good shape but there is some peeling on railings. How should we prep the railings? I am planning to do a gentle sanding remove obvious peeling stain. Do we need to use the cleaner and brightener as well? 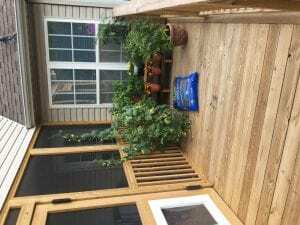 Or is in necessary to remove every bit of stain as we did for the deck? Pep by pressure washing to remove any peeling solid stain. Just remove what is loose and use a solid over top. I'm a novice when it comes to any sort of home repairs and maintenance. We bought a house 2 years ago and are just getting to the decks now. The decks are very old, gray, split, and weathered. We live in MA and one of the decks is in direct sunlight most of the day. The horizontal are free of obvious stains, but the railings have some remnants of red on them. I'm not sure if semi-solid or solid stain. My plan is to pressure wash and sand to get rid of it all. I have been told by some people that since it was a dark color to begin with, I need to stick with a dark color. I want to use a solid white stain on the railings and a red semi-solid or transparent on the horizontal. Will this work if I get rid of all previous stains? If you remove all the stain then you can go any color and type of stain for the floors. You do not have to remove all for the railings that will be painted white, but you may need a few coats to cover the red. Use Flood solid stains for the rails and Armstrong Clark in Sierra Redwood or Sequoia for the flooring. I don't want to paint the railings as paint chips, I want to stain them. I thought I needed to remove all prior stains before applying new stain so it adheres to the wood. I know Behr makes a solid white stain. Do you not recommend this? We do nit suggest any Behr products. If you want a solid color deck stain, try the Flood or Cabot versions. I have an old redwood deck that has not been maintained. We are getting it professionally restained. The contractor is pushing for using a dark colored, acrylic solid stain (SW Woodscapes) on the verticals and light colored semi-transparent on the floor. The verticals are simple rough cut 1x1s – not round smooth spindles. I am leaning towards doing Defy Extreme semi-transparent on the floor and rails. The advantage of solid stain would be better coverage and longer initial wear. The disadvantage is peeling down the road and more difficulty redoing it once it has peeled. Which would be the least future maintenance of the verticals: restaining with semi-transparent every 2-3 years or having to scrape, sand and redo the solid stain every 5? Solid stain will work much better on verticals. It will last 3-4 years with minor touchups. You will not need to scraps and sand to reply the solid. Just clean and reapply. Color opinion needed! Almost ready to order my stain. I am looking at the AC Oxford brown for the flooring and really don't want to commit to white railing so am thinking about the semi trans cedar. I need to keep the flooring semi solid for UV coverage and there is some newer replaced wood with the much older. Need some idea on the color for the railings to go with Oxford brown. I am just too afraid to commit to the white railings and a little scared to commit to a total Oxford brown deck. It's traditional style and square with a bump out on one end. Opinions! I have been trying to find a picture of a total Oxford brown deck and can't find one. I've googled images etc. and just can't find an image of one to get an idea of what it would look like. This is my summer project and I don't want to screw it up! I originally saw a dark brown composite deck that had all the lighting and it was really my inspiration image however my deck is PT so I don't know if it will produce the same effect. Does anyone out there have a picture of a total oxford brown deck?! AC is a little limited on the semi solid colors and the others are too red for me and the mountain cedar looks kind of muddy. Have a lot of nails on the flooring too along with intense sun so the semi-solid is what I need. 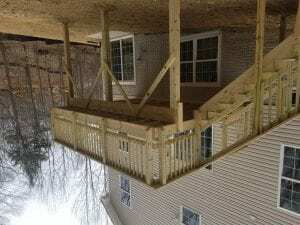 I am wanting to do the two tone project on my deck. What oil based product do you recommend for the white on the rails, or do I need to use an oil base? I am assuming the oil base will handle the summer/winter elements in NW Missouri better than a latex base product. For the solid white on the rails you could use either the Flood or Cabot Solid stains. You do not need an oil based stain. Are they latex based then? Do I prep the rails the same as deck floor for painting with solid stain? Water based or oil based for the solid stain. Prep all wood the same. I am currently redoing an old pine deck in Baltimore, Maryland that is 800 square feet. I am stripping the deck floor and am trying to find out the best way to do the verticals. The railing has a solid stain on it that needs to be redone. My question is what preparation do I need to do to the verticals need before I stain them or paint them. I would like to strip all of them but it would take too long. Also, does it matter if I use stain or paint? You will have to do another solid stain. Prep by removing dirt and and peeling stain before reapplying another solid.